I’m surprised how often the Drake Equation is still mentioned when people discuss such things as the search for extra terrestrial intelligence (SETI), astrobiology and problems like the Fermi Paradox. Frank Drake‘s equation, which he developed back in 1961, leaves much to be desired in terms of what it’s supposed to tell us about both the nature and predominance of extraterrestrial life in our Galaxy. Consequently, the Drake formula relies on ‘stabs in the dark.’ This makes it highly imprecise and unscientific. The margin of error is far beyond what should be considered acceptable or meaningful. Another major problem of the Drake Equation is that it does not account for two rather important variables: cosmological developmental phases and time (see Cirkovic, “The Temporal Aspect of the Drake Equation and SETI”). The Galaxy’s extreme age and the potential for intelligence to have emerged at disparate points in time leaves an absurdly narrow window for detecting radio signals. The distances and time-scales in question are mind-boggingly vast. 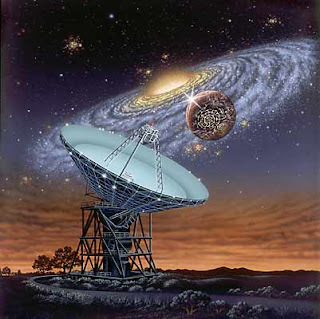 SETI, under its current model, is conducting an incredibly futile search. Which leads to the next problem, that of quantifying the number of radio emitting civilizations. I’m sure that back in the 1960’s it made a lot of sense to think of radio capability as a fairly advanced and ubiquitous means of communication, and by consequence, an excellent way to detect the presence and frequency of extraterrestrial civilizations. But time has proven this assumption wrong. Our radio window is quickly closing and it will only be a matter of time before Earth stops transmitting these types of signals—at least unintentionally (active SETI is a proactive attempt to contact ETI’s with radio signals). Due to this revelation, the entire equation as a means to both classify and quantify certain types of civilizations becomes quite meaningless and arbitrary. At best, it’s a way of searching for a very narrow class of civilizations under very specific and constrained conditions. Rather, SETI should continue to redefine the ways in which ETI’s could be detected. They should try to predict future means of communication (like quantum communication schemes) and ways to identify these signals. They should also look for artificial objects such as megascale engineering and artificial calling cards (see Arnold, “Transit Lightcurve Signatures of Artificial Objects”). The equation is used to determine the number of radio capable civilizations as they conduct their business on their home planet. Again, this is a vary narrow view of ETI’s and the space of all possible advanced civilizational types. Moreover, it does not account for any migratory tendency that advanced civs may have. The Drake Equation does not tell us about exponential civilizational growth on account of Von Neumann probe disbursement. It does not tell us where advanced ETI’s may be dwelling or what they’re up to (e.g. Are they outside the Galaxy? Do they live inside Jupiter Brains? Do they phase shift outside of what we regard as habitable space? etc.). This is a serious shortcoming because the answers to these questions should help us determine not just where we should be looking, but they can also provide us with insight as to the makeup of advanced intelligence life and our own potential trajectory. In other words, post-Singularity ETI’s may represent the most common mode of existence for late-stage civilizations. And that’s who we should be looking for rather than radio transmitting civs. Again, and more generally, we should probably adopt the contact pessimist’s frame. Back in the 60’s and 70’s, when the contact optimists like Sagan, Shklovskii and Drake ruled the Earth, it was not uncommon to think that N in the equation fell somewhere between 10x6 to 10x9. Put another way, as we continue to search for advanced ETI’s, and as we come to discover the absurdity of our isolation here on Earth, we may have no choice but to accept the hypothesis that advanced life does not venture out into space for whatever reason (the most likely being self-destruction). George P. Dvorsky serves as Chair of the IEET Board of Directors and also heads our Rights of Non-Human Persons program. He is a Canadian futurist, science writer, and bioethicist. He is a contributing editor at io9 — where he writes about science, culture, and futurism — and producer of the Sentient Developments blog and podcast. He served for two terms at Humanity+ (formerly the World Transhumanist Association). George produces Sentient Developments blog and podcast. George - I liked your article but disagree with your logic in the type of signal we should be looking for. I have my own SETI station running and had to go through a long thought process in its development. Any ETI that I might hope to detect must be more like myself than unlike me, in most basic ways. Not to put too fine a point on it, but, for example, I think this ET would think in the same time frame as we do. Not at the speed of a glacier or at the speed of bullet, but somewhere near our ‘thinking speed’. This is necessary to make the signal recognizable to us when finally detected. ET’s physical makeup would have to be about the same as ours. Not as small as a bacterium or as large as one of the rolling hills I can see from my window, but somewhere in-between. This would give him the same type of control over his environment, and the same capability as I have to construct the needed transmitter, which could produce a signal which I can recognize. Not all ETI need be like me; only those who I have a realistic chance of detecting. ET’s transmitter must be an RF signal generator. Some other, more exotic form of communication may well be in use, but since I can’t construct a receiver to detect exotica, it’s not worth considering. This leaves open optical SETI - but not for me. I know nothing about the optics required on that scale. As an RF guy, I’ll stick to the area where I have a shot at SETI success. The signal must be a deliberate beacon. That’s the only type I and most other SETI stations would have a ghost of a chance of hearing. Leakage detection seems less likely, if only because of the transmit power requirements needed to show up on my system. Detecting planetary Radar also seems unlikely, because it seems that it would only be sent for short periods. Once a radar echo was recovered, the transmitter would most likely be turned off or pointed somewhere else. The modulation scheme needed for an effective Planetary Radar might also make it difficult to recognize on this end. If I were ET I would set my beacon up in the waterhole to maximize its chances of discovery. I would want to be heard, and that is the most obvious place to start. The hydrogen line is at 1420 MHz and the hydroxyl line at 1662 MHZ. I would transmit at exactly 1/2 way between the two at 1541 MHz. I would expect ET to similarly transmit somewhere near the middle of the waterhole, if he wants me to detect him. An ideal interstellar beacon should be narrow band to concentrate the transmit power, and to make it distinguishable from natural sources. It must be directed at our star. This is necessary to conserve power, and to make possible reception over huge distances. So a directed beacon is what I am looking for. I can see ET pointing such a beacon at each candidate star, one at a time, sending the beacon for some length of time, and then moving to the next star. My ET’s interstellar beacon would be locked onto each star for about a year at a time. We may have missed ET’s signal already, and may have to wait another 300 million years for it to show up again. Or, it may be starting tomorrow. Since we just don’t know, we may as well assume that it starts tomorrow. If I concentrate on looking for myself, I may well miss signals sent by those not like me. But I know that creatures who think like me exist (if only by Earth’s own example.) Designing our search around those not like us involves pure speculation, and will reduce our chances for SETI success. The Drake equation was never a formal equation, nor meant to be. It was a string of factors that the astrophysicists deemed relevant at that time. I think that the reason for its continued use is that it is widely known, partly from Sagan’s legacy. If those of us interested in these questions want to make the Drake expression evolve, nothing is stopping us. Regarding the tautology of the arguments employed in Rare Earth, here is my review: http://www.setileague.org/reviews/rarearth.htm (the concluding sentences are quoted in David Darling’s Life Everywhere: The Maverick Science of Astrobiology). Finally, it is too early for astrosociobiology, given that we are still dealing with a single sample.